I use Mentor Questa a lot, and when I am at work the visual lag of interacting with the GUI through VNC is almost imperceptible. But, when I am working remotely that visual lag is, of course, more noticeable. One possible solution that reduces the lag considerably compared to VNC, NX, or Windows Remote Desktop is to run Questa natively on your local computer. The first step is you need to be a registered customer of Mentor Questa, so you can have access to the installation files on their very good Mentor Graphics SupportNet customer support site. Below is a picture of what it will look like when you login. Next, you will download all of the files for installation. I grab all of the files that Mentor makes available for a release and don't think about trying to get just the right ones. Once downloaded, the next step is to run the install script provided by Mentor "install.linux". This error, which is terribly unhelpful, is solved by simply installing the following package in Ubuntu which is mentioned in this article from stackoverflow. 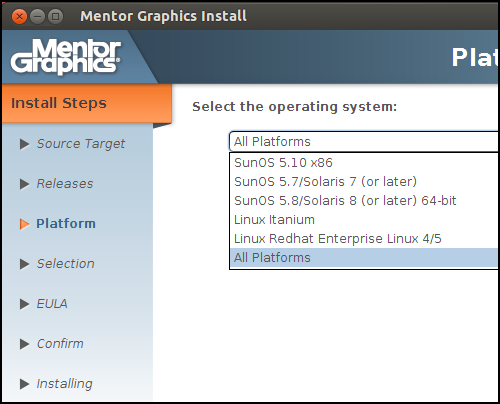 One of the first questions you will get asked from the Mentor Graphics Install is what operating system you are using. Choose "All Platforms". The rest of the installation is straightforward. Then, append to your Linux PATH with a line like the below, depending on where you installed Questa. Note that the install path from the installer was "~/mgc/questa_10_3" in this example, but we need to add the binary path below. If you now tried to use the lmgrd or some of the other FlexLM components that Questa needs, you would get an error like the below. To be able to work with FlexLM (the licensing daemon that Mentor and a lot of other EDA vendors use) you need to install one more Linux package which is mentioned in this article from ARM. The next step is to setup the environment so that FlexLM knows where the license server is with a command like the below. Ask your IT admin for what is your "flexserver" should be. I did have to do a little more work since the FlexLM license server was behind another internal firewall - that will be for the next post. But, you might be lucky and not have to do that step or if you are using a local license file from Mentor which would work just fine. If everything is going well with your licenses, you should see something like the below. The below command checks the license server to see if everything is good. The "mgcld" is the Mentor daemon that keeps track of Mentor licenses. If you don't see the Mentor daemon or the command isn't returning the license server information correctly, you will need to debug that before launching Questa. Hope this article gets you another alternative for doing development with Mentor Questa. The next post handles setting up the licenses if you are connecting to a license server. This article is about installing Mentor Questa on Ubuntu. I am, however, running Ubuntu inside a virtual machine on Apple OSX and am running the VPN from OSX. I am using Parallels Desktop as the virtualization program. I have not figured out a way, or if it is even worth it, to run Questa natively on Apple OSX.